We don't normally think of glitz when we think of Walgreens, but maybe that's entirely the point. The company is building the world's "most complex, powerful and digitally advanced" sign to hover over their new flagship store. And 17,000 feet of it is covered with 12 million LEDs capable of producing a trillion colors. But that's only part of the sign. 250,000 pounds in weight, the entire sign spans 43,720 square feet when including vinyl components. 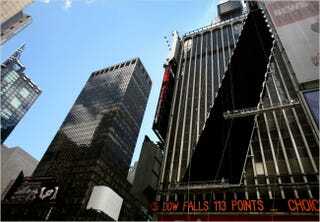 That easily trumps the old Times Square champion from NASDAQ, which covered a suddenly modest 11,000 square feet.